In 1967, immediately after the plan for the Shika Nuclear Power Plant (NPP) was announced, the Togifukuura Alliance was formed to oppose the plant. A big movement evolved including landowners, fishermen and labor unions. Fifteen years later, in 1982, Tetsuya Tanaka (then 39) came to the Noto region from Osaka as a union organizer. (The former name of Shika NPP was Noto NPP. (Ed. ))At the time, the opposition movement was facing its greatest crisis. Until then the thing which had prevented construction of the NPP was the Saikai fishing cooperative. One of the main fishing cooperatives in Ishikawa Prefecture, it had resolutely opposed the plant. However, determined to push ahead with construction, Ishikawa Prefecture adopted the mean spirited tactic of terminating the Saikai fishing cooperative’s fishing license. After the accident at the Three Mile Island nuclear power plant in March 1979, city-based activists like me from Kanazawa City and Toyama City often visited the site of the proposed reactor. It was there that I met Tetsuya Tanaka, who was in there with the locals giving encouragement to the movement. He realized that if the Saikai fishing cooperative collapsed it would be impossible to prevent construction. He spent many days in the solidarity hut (built on site by the opposition movement) thinking of how to organize a movement in which the locals would not come out as losers. Eventually he lit upon the idea of organizing with the locals around the issue of “nuclear disaster prevention”. At the time this was a taboo topic, because it implicitly accepted that construction would proceed. Of course everything was done to prevent construction, including election campaigns, petitions, protest demonstrations and visits to local residents, but in the end we couldn’t prevent construction. Construction began on the 540 MW Shika-1 reactor in December 1988. On the same day, 200 plaintiffs lodged an appeal to the court for the termination of construction. It is very difficult to maintain opposition when new facts on the ground are being created all the time. However, though few in number, there was firm solidarity among the members of the movement. 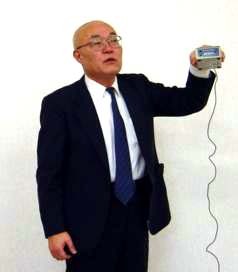 Tetsuya Tanaka continued at the center of the court case and the independent nuclear disaster prevention movement. For the latter, residents themselves made submissions to Ishikawa Prefecture and Shika Town, conducted their own evacuation drills and developed their own radiation measurement network. Joy came to us this year, 17 years after the case against Shika-1 reactor was launched. On March 24th the Kanazawa District Court handed down the verdict to terminate operation of the Shika-2 reactor1. It was the first such verdict ever in Japan. Tetsuya Tanaka said he wept when he heard the verdict to think of all the people who had died too soon to see this day. He has retired as a union organizer, but he has become thoroughly a local. He loves to drink and to debate. He is like a monk in training2 and no doubt his activism will continue until nuclear power is eliminated. *Hideki Hayashi runs an equipment design office and is a member of the plaintiff’s coordinating committee.